Koda has settled right in here with his “sister” Morgan and myself. We walk daily in the park, play ball in the afternoons He loves to go on little road trips. He has gained some weight. Koda was recently diagnosed with Metatarsal fistula of both back feet, an uncommon disorder, he has been on antibiotics and Vit E. Thankfully, it seems to be under control at this time.. It doesn’t interfere with his playful personality. He is full of energy and seems happy. 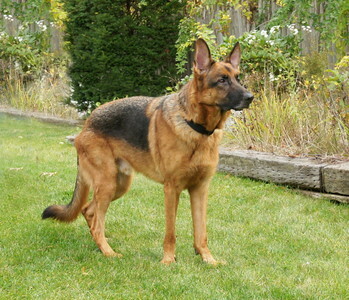 This handsome 3-year-old was in a loving home with an older male GSD, two cats and a girl who was his special person. The older dog died last year at age 12, the girl went off to college, and her father felt that Koda needed a home where he could get more attention. Our evaluator noticed that Koda was looking around for “his” cats during the whole visit and seemed more comfortable when they were nearby. 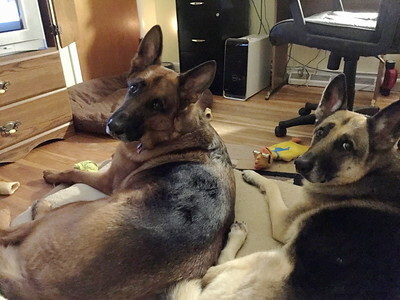 The move to a foster home was confusing for Koda, but his adjustment was made easier by the 8-year-old female GSD who accepted him into the home with a minimum of fuss. They have become good friends, and he loves having his foster Mom, who is retired, home most of the time. They go for long walks in a park almost every day, and there are play sessions in the fenced yard several times a day. Koda is very good with his foster sister; he can be reactive when seeing others dogs, but he has learned to sit on command and wait for the other dog to pass by. 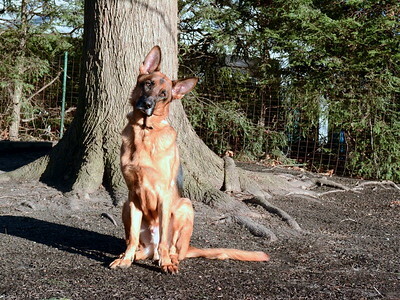 He is unsure when he first meets a new person and will bark but quickly calms down and then is ready to make friends. He loves affection, and his foster Mom says he’s fun to play with, clever with his toys and knows how to engage you for play. After a good game of fetch in the afternoon, he’s happy to hang out and relax after supper and play with inside toys before bedtime. If you would like an active companion who will enjoy learning new things, having fun and just being with you, please ask us about Koda.